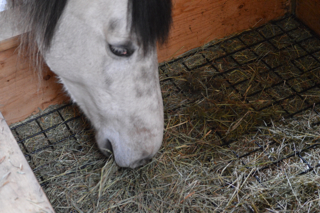 First of all, regardless of which hay you feed, if you place it in a slow feeder (or hay net) and allow your horse 24/7 access to hay – you will have a much healthier, happier horse. If you put the right kind of hay in that slow feeder, even obese or laminitic horses will thrive – and yes, I’ve tested this! Some people think that whether the hay is 1st cut or 2nd cut influences sugar levels – but in fact it is more determined by the type of plant, whether it has bloomed/seeded or not, and the time of day the hay is cut. That’s why you (or your hay company) needs to have the hay analyzed to determine the actual NSC levels. Total Digestible Nutrients (TDN) – This is a measure of the total digestible nutrients in the hay or its energy value. TDN may be used in place of DE or offered in addition to DE. It may range from 40 to 55 percent. Starch and Sugar – This is a measure of sugars and starches in the feed. You should feed no more than 15 percent of total daily calories from starch and sugar to horses with EPSM (equine polysaccharide storage myopathy) and PSSM (polysaccharide storage myopathy). EPSM is a muscle disease found in over 100 draft breeds that may cause severe weakness and muscle wasting in horses of all ages, poor performance, abnormal hind limb gaits and shivers, in which the muscles keep twitching. PSSM is a muscle disease found in horses with Quarter Horse in their breeding, such as American Quarter Horses, Paints and Appaloosas. Symptoms include reluctance to move, muscle stiffness, sweating, shifting lameness and tremors in the flank area. NOTE: You’ll see that these authors above recommend a starch and sugar content of 15% or less – but for “easy keepers” or those prone to laminitis or founder, many vets recommend 12% NSC or less. Also, if you are giving your horse grass turnout, then the lowest sugar levels in grass are at night, after the sun has set. The highest levels are in the morning, before the dew burns off. If you live in BC, Canada, then Hay…Girl! and Wrayton Hay Transport sources low sugar hay from all over BC and Alberta. If you’re having issues with your horse’s health, or you’ve noticed the “psychologically starving” element at work, then this is the best book I’ve read on this topic by Dr. Juliet M Getty, PhD. She also has separate books for specific conditions like Laminitis, or the Aging Horse. I always had horses growing up, and I finally convinced my husband to let us get a few horses now that we live in a home with a good sized area to keep them. It’s been a long time since I took care of horses, and I imagine that opinions have probably changed a lot in regard to what we should be feeding the horses, so I appreciate this information. I like how you point out that the kind of hay you choose shouldn’t be decided so much by the sugar levels, but more by what type of plant it is, whether it has bloomed/seeded or not, and the time of day the hay is cut. I’ll start paying better attention to all of those things! Hi Jen – Congrats on your return to wonderfulness of horses! Just to clarify, as perhaps my post was confusing, hay should be chosen based on sugar levels (low sugar). But the sugar level is not just determined by the type of hay it is, but also by other factors; such as time of cutting, drought conditions (increase sugar in plants), etc. That’s why it’s best to buy from a vendor that tests their hay.